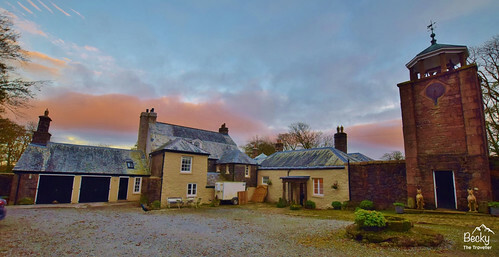 Tor Royal Bed & Breakfast was my base in Dartmoor National Park, during my UK challenge. And what a great place it was to stay. 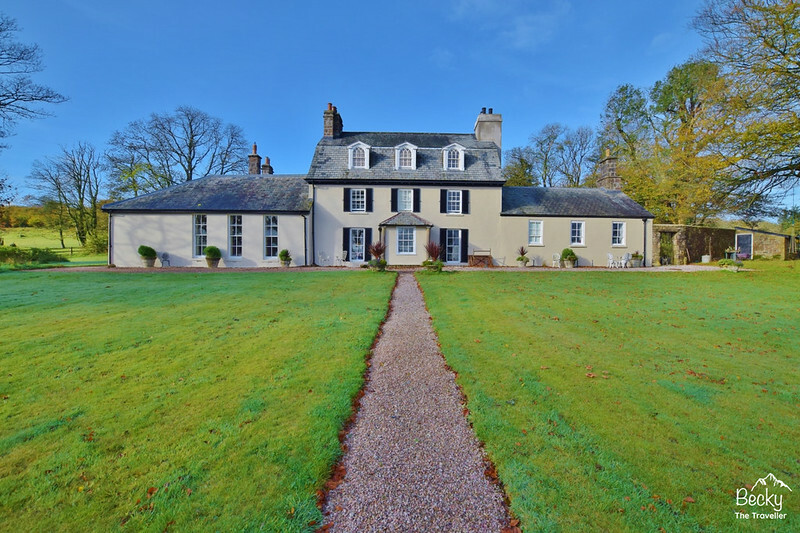 The Bed & Breakfast is part of the family home, which is also a working farm. I didn’t know what to expect, but I was pleasantly surprised when I arrived. 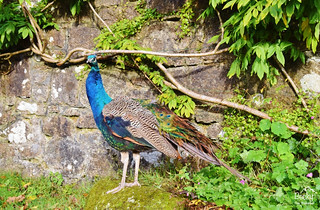 And I was even greeted by their friendly peacock. Ok, he did run away from me. Probably because I was pointing my big camera lens at him! Sorry, Mr Peacock! 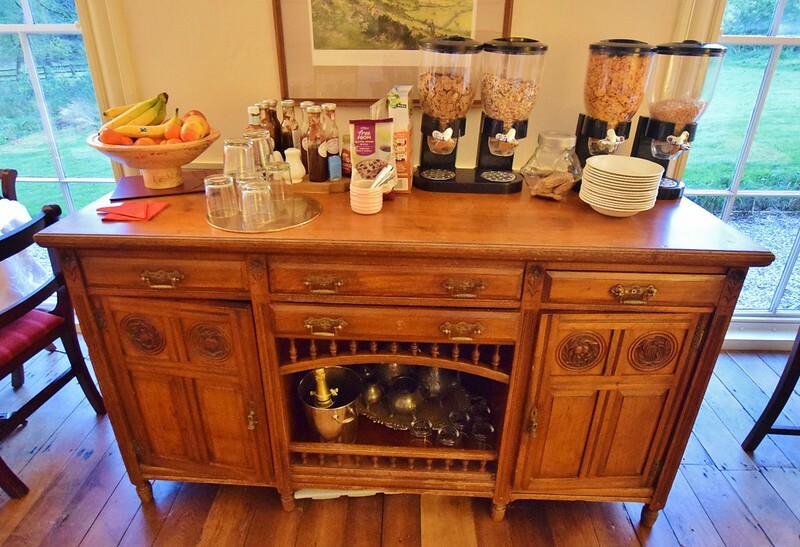 Read more about my stay at this friendly Bed & Breakfast in Dartmoor. 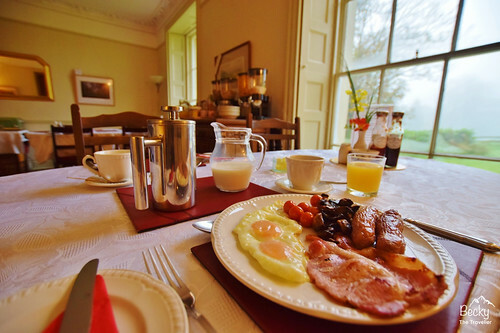 The Bed & Breakfast is located west of the centre of Dartmoor National Park in Devon. It’s about a mile away from Princetown centre, which has one of Dartmoor’s main Visitor Centres. 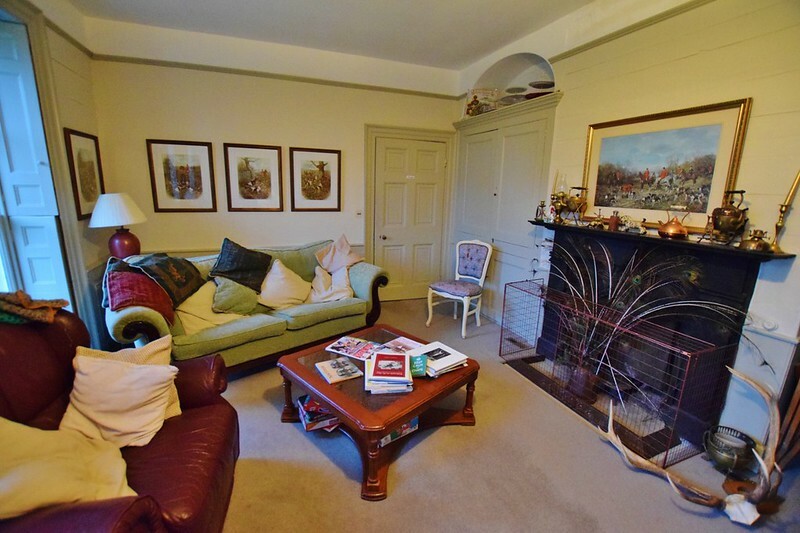 Nearby Tavistock is 8 miles, although the drive takes you on some narrow lanes so it’s about a 20-minute drive. The closest cities are Plymouth (16 miles) and Exeter (27 miles). Very friendly and fluffy cat! Tor Royal Bed & Breakfast is run by Justine and her family. She’s a lovely host and I felt very welcomed into their home. From the outside, it doesn’t look like a traditional B&B but I think that’s the charm of staying there. All the rooms have high ceilings and the detail is beautiful. Be sure to look up at the ceiling in the main room and you’ll see little trains going around the edge! 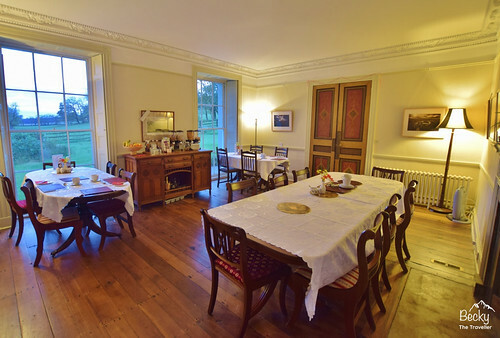 The Bed & Breakfast has a backdrop of fields and countryside all around. You really feel at one with nature as soon as you arrive. Sitting down to breakfast watching the mist lift across Dartmoor was a relaxing experience. After driving about a mile up the narrow Devon country lane, there are clear signs directing me which way to go. Driving into the Tor Royal entrance there’s a large forecourt. For a minute I wonder if I am in the right place. The building is stunning and this is just the back entrance. A large tower with a clock stands in the middle and two stone guard dogs! After ringing the bell in reception and waiting a few minutes, I wandered back outside to then bump into Justine (and a peacock) who has been working on the farm. She welcomed me into the Bed & Breakfast first showing me into the breakfast and lounge rooms downstairs. Then takes me up the stairs to my room at the end of the house. My room is a single overlooking the courtyard. 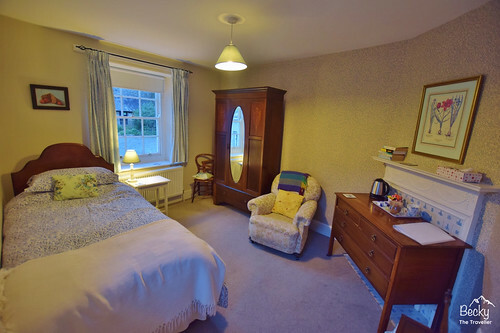 The floral decoration fits perfectly with the style of the accommodation and it feels warm and cosy. There are a tea tray and a jar of biscuits, always a bonus. I love my tea as you already know! 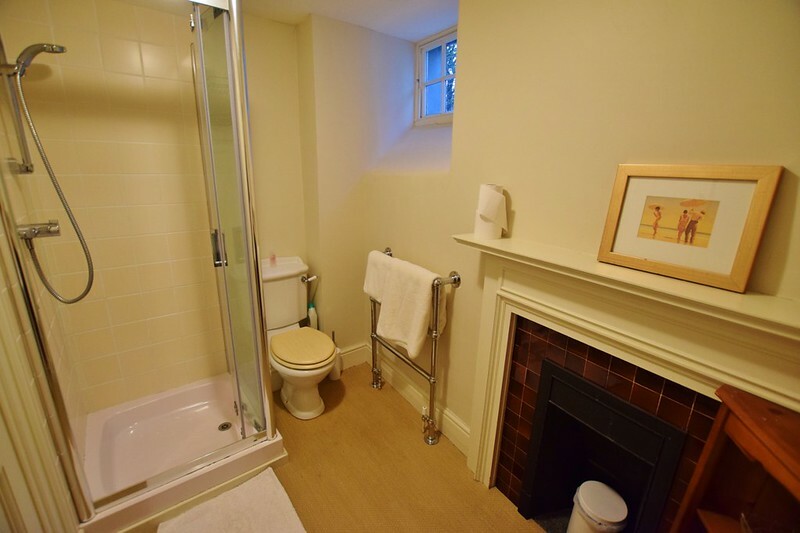 There is a little corridor linking to my en-suite bathroom, making it feel like I have a bit of space. Well, until I unpacked my bag on the floor! On the desk, there’s information pack and a hairdryer hiding in the drawers. The breakfast is served off the main room. Again the attention to detail is stunning, with the original decorative doors and large windows overlooking the garden. It’s a shame on my first morning that all I could see was a lot of fog. But I won’t blame Justine for that! The B&B was full, with four ladies staying in the other rooms. They have breakfast slightly earlier than me at one table, which means I have a table all to myself. Justine serves me a cafeteria coffee then I help myself to the continental options on the breakfast cabinet. For the tea lovers who are reading, there’s a great choice of every possible tea you could want in a little basket. Day one I opted for the full English breakfast and day two, I remembered to ask for poached eggs. I prefer them to fried! But still a lovely breakfast and a great start for a day’s hiking in Dartmoor National Park. Justine was very welcoming and friendly. Plus, did I mention the very cute and fluffy cat who was more than happy for me to fuss. I lost my cat, Monty at the end of last year so it was nice to have some cat cuddles :). She also has great local knowledge of the area and its interesting history. The book ‘The Hound of the Baskervilles’ has many places based on it from the local area and she was able to give me some great tips. Not only is the house beautiful but the gardens around the property are stunning too. It rained for the first couple of days but I did spend some time relaxing in the garden when the sun finally appeared! Since the B&B is located only a mile up the road from the main centre of Princetown it was perfect for my time in Dartmoor National Park. The visitor centre is fantastic, you could literally spend a couple of hours there reading about the history and nature around the area. There are some wonderful walks that you can do directly from Tor Royal. Or alternatively, visit the official Dartmoor National Park website at www.visitdartmoor.co.uk. There’s a great range of places to stay, eat and drink. Plus a huge amount of information on walking, cycling, riding and other activities. *I was a guest at Tor Royal Bed & Breakfast on behalf of Dartmoor National Park. However, all views and opinions are my own.